Some of you might have been mesmerised by Nicola Sturgeon's hand movements or maybe it was Ed Miliband's suggestive gazes down the camera lenses that got you hooked, but I avoided the political flirtations - I listened on BBC Radio 5 Live. I wasn't hypnotised by Nigel Farage's stares, but instead forced to listen to every single word being said. This means I have a unique perspective on how the leaders actually did. Whilst it was fantastic to finally get a debate after all of the political wrangling; I fail to see it adding much to the election campaign.. Although interesting points were made it will not have made a lasting difference to the outcome of the election. After her appalling LBC and Daily Politics interviews, Natalie Bennett was clearly much better prepared (I'd certainly hoped she would be). She stuck to her party's anti-austerity rhetoric, regularly attacking labour for their acceptance of spending cuts. The Greens called for people to vote for their convictions rather than tactically, aiming to send a message to the government rather than ensuring a progressive coalition. However, Bennett did not stand out above the others in the debate, her lack of charisma really hindering her. Leanne Wood did reasonably well and got her party a significant amount of national exposure, despite it having fairly limited support, even in Wales. Similarly to the Greens, toed the party line and earn’t well deserved support from the audience by standing up to Nigel Farage over health tourism (although current polls predict UKIP to beat Plaid in Wales). Unfortunately for Leanne Wood, Plaid Cymru is unlikely to be the Welsh equivalent to SNP;Welsh Labour have performed well in government and there is a lack of desire for significantly more powers for the Welsh Assembly. I know it seems like a cop out to rank these two the same, but the established leaders did fine and only fine. Neither of them took control of the debate and the failure of either of them to stand out highlighted the need for a head-to-head debate. From what I understand Ed Miliband practically flirted with the audience on camera, fortunately for me I missed his attempts to imitate Clegg. He once again apologised for Labour's record in government, and continued to focus on the future, regularly criticising the Conservative for not taking their eyes off the past. He argued that the Conservatives continued looking backwards meant that there was really no future with the Torys. Cameron spent most of the time defending the Conservative Party against a barrage of criticisms of high spending cuts, especially from the left-wing Greens, Plaid Cymru and the SNP. He, however, struggled on immigration with an unrelenting Farage, and showed the same nervousness he had with Paxman the week before. I know, I know, another cop out, but it's really difficult to rank! (maybe it’s the future diplomatic in me?!) Farage clearly set himself apart from the other party leaders. His position on the EU, benefit tourism and health tourism all contrasted the other six parties. Despite attacks from all sides Farage said exactly what he needed to whilst still coming across as the relaxed pint and cigarette man he always seems to be. He knows his voters and appealed straight to them. He also made UKIP look persecuted by the other leaders, focusing on issues that other six parties disagreed with (especially UKIP’s position on health tourists with HIV). Nick Clegg still retains all of his charisma from the last election debates. He robustly defended the Lib Dem's record in government, whilst challenging the other party leaders to keep all their election promises in the event of another hung parliament. Particularly notable was when he called on Miliband to apologise for the Economic Crash – arguably the closest anyone came to the "knockout blow" that was longed for by the 5 Live commentators. Finally, Nicola Sturgeon stood out in what was a fairly mediocre debate. She had two things to do, ensuring that people in Scotland considering voting for the SNP and to allay the fears of those in England who feel threatened by the secessionist party. She managed to do both, despite the crowded field of similar parties. Queen of the quick and witty one-liners, she stood up to Miliband and Cameron saying the SNP has presented a clear alternative to spending cuts. No doubt some people in England will be wishing they could vote for her too. 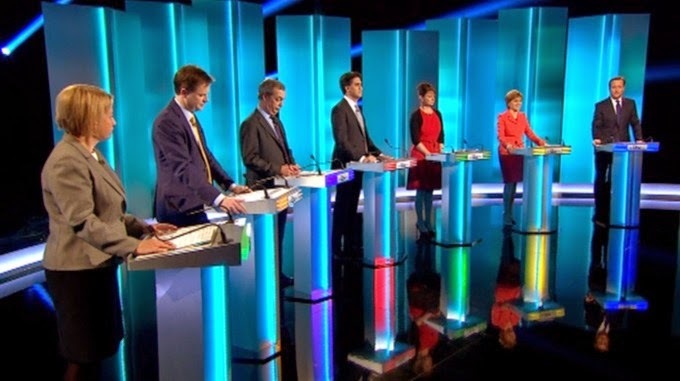 The seven-way debate was an interesting experiment by the broadcasters, their hand partly forced by David Cameron's constant refusals to do anything else. The party leaders performed exactly how everyone expected them to, and the polls following the debate indicated that (although I feel Nick Clegg was hard done to). This format massively benefited the smaller parties, the SNP will be pleased with the opportunity to get Nicola Sturgeon on the national stage, UKIP will hope that it helps halt the decline of their support and the Greens and Plaid Cymru will be grateful for the national exposure that they often lack.